GH3C-281 | Size: 50 ml / 1.69 fl.oz. 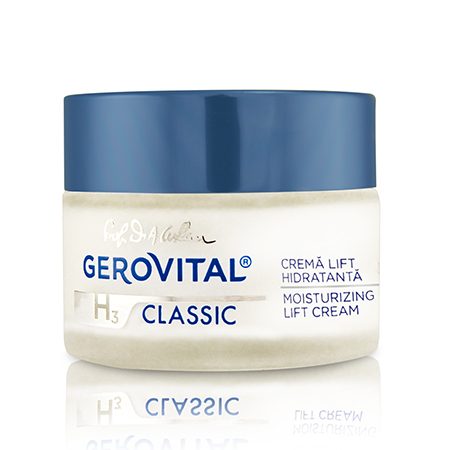 Recommended for age 30+, the cream was developed especially for skin that shows signs of dehydration and loss of elasticity. The active ingredient of botanical origin Sepilift offers a lifting effect, smooth fine lines and corrects skin imperfections. The combined action of Hyaluronic Acid and Aquaxyl provides powerful moisturizing effect and improves skin barrier function. A dose of Vitamin E provides antioxidant protection against free-radical damage, while Juvinity™ refreshes, reducing the visible signs of skin aging. Apply in the morning on a clean skin. INGREDIENTS: AQUA, CETEARYL ALCOHOL, CETEARETH 20, GLYCERYL STEARATE, GLYCERIN, GLYCINE SOJA OIL, SQUALANE, XYLITYLGLUCOSIDE, ANHYDROXYLITOL, XYLITOL, DIPALMITOYL HYDROXYPROLINE, CAPRYLIC / CAPRIC TRIGLYCERIDE, GERANYLGERANYLISOPROPANOL, SODIUM POLYACRYLATE, HYDROGENATED POLYDECENE, TRIDECETH-6, BUTYROSPERMUM PARKII BUTTER, TOCOPHERYL ACETATE, SODIUM HYALURONATE, PHENOXYETHANOL, METHYLPARABEN, ETHYLPARABEN, PROPYLPARABEN, BUTYLPARABEN, PARFUM, TETRASODIUM EDTA, SODIUM HYDROXIDE, BHA.